Our early 1950s Member of Parliament was a mixture of John Buchan hero and a shyster of Archer-like proportions. 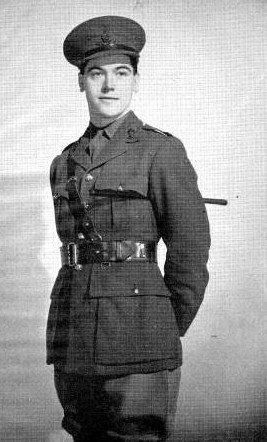 Although Peter Baker was described as “stubby, short-sighted and thoroughly unmilitary in appearance”, he joined the army at 18. The picture shows that they obviously made an officer and a gentleman of him. During the war he was dropped behind enemy lines in The Netherlands for sabotage and espionage, working in enemy territory with resistance groups. He was twice captured by the Gestapo and twice escaped. By the end of the war he was a Captain with a Military Cross. Back in Civvy Street he told friends that he was a 20th century Shakespeare; and published two slim volumes of verse and a treatise on modern political theory. Then he turned to finance. In three years he established three publishing firms and an investment company. With his background and connections he had no trouble raising money. He was the son of Major Reginald Baker, cinema magnate and managing director of Ealing Studios. Financial backing came from wealthy Sir Bernard Docker and Sir John Mann. Viscount Astor and Major Henry Legge-Bourke, MP were on his board of directors. Soon Peter Baker was running 18 companies, from Edinburgh to London. He loved playing the role of young man-about-Mayfair, entertaining lavishly and keeping tables permanently reserved at West End nightclubs. When one of his companies got into trouble, he would shift money from another, start a new one, or find new money from his backers. None of his companies made money but nobody seemed to notice at first. Then he went into politics. As a war hero, from an old Norfolk family he seemed an ideal candidate for the South Norfolk Conservatives. In 1950 he surprisingly beat Labour’s Christopher Mayhew who had won the seat after the war. But Baker’s financial troubles deepened. He produced ‘bills of exchange’ apparently guaranteed by Docker and Mann. When one bank refused to give him further loans, he would cash another bill of exchange with another bank and repay the loan at the first. Amid resignations and refusals of further finance, his companies expired around him. Baker booked himself into a sanatorium where no visitors were allowed. One he was unable to keep out was Chief Detective Superintendent Robert Stevens of Scotland Yard’s Fraud Squad. He arrested Baker for ‘uttering forged documents.’ He had forged the signatures of Docker and Mann to the bills of exchange. His forgeries had cost the banks hundreds of thousands of pounds. His company debts were astronomical, while his father had spent much of the family fortune trying to help him. A psychiatrist described Baker as suffering from ‘hypomania’. People with this disorder can be extremely outgoing, competitive and energetic, with a flood of ideas and a desire for success. Captain Peter Baker MC, MP, war hero, cavalier financier and poet, stood in the dock at the Old Bailey and pleaded guilty to six of the seven charges. He was sentenced to seven years in prison. Subsequent local MPs like John Hill, John MacGregor and Richard Bacon are safer but less colourful.